Ben Vaughan didn’t need to cross the Edmund Pettus Bridge in Selma, Alabama, to know that civil rights remains a volatile issue in America. The 36-year-old electrical engineer from Louisville is knee-deep in the struggle right here in Kentucky. In fact, Vaughan, a member of Jewish Community Relations Council, is personally involved in the fight to restore voting rights to hundreds of Kentuckians who have been unfairly purged from the rolls. More on that later. 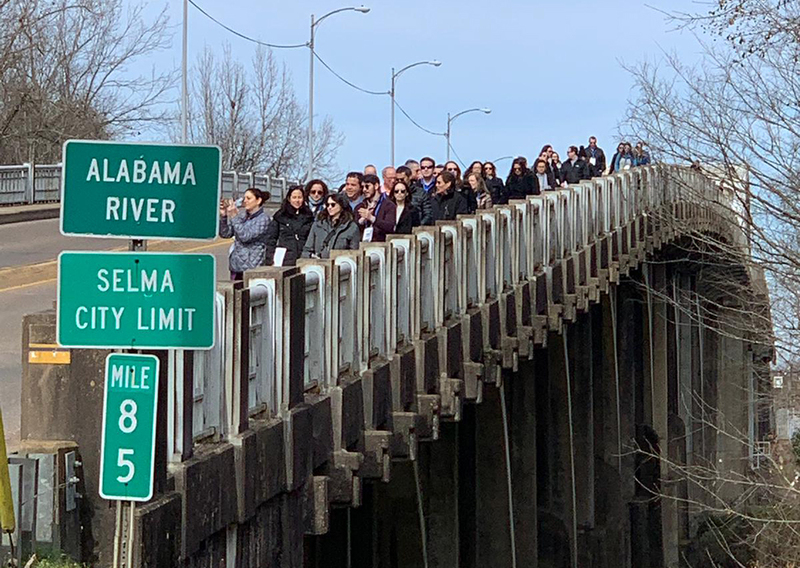 Vaughan, a member of the National Young Leadership Cabinet of the Jewish Federations of North America, was in Alabama with 84 other Cabinet members from Jan. 31 to Feb. 3, immersing themselves in the history of the civil rights movement. One of their visits was to the Edmund Pettus Bridge, scene of the Bloody Sunday confrontation between armed police and Rev. Martin Luther King Jr’s supporters on their historic Selma-to-Montgomery march in 1965. “It’s a very small bridge,” Vaughan said, but with “unique aspects” and markers describing its place in history. The group also visited civil rights institutions and landmarks in Birmingham and learned more about the Jewish role in the struggle. That roll wasn’t always what it’s made out to be. But Jews were targets, too. On April 28, 1958, Temple Beth-El, in Birmingham almost became a scene of devastation when 54 sticks of dynamite were bundled in a canvas satchel in a basement window well outside the Conservative synagogue. The explosives never went off because the fuse had fizzled out. That was only one of many attacks, or near attacks, on synagogues across the South. The Beth El incident foreshadowed the bombing of the 16th Street Baptist Church in Birmingham in 1963 that killed four black girls. The Cabinet members visited other sites and institutions dedicated to the movement, including the Lynching Memorial in Montgomery, dedicated to the darkest chapter of the segregated South. One of those victims was a Jew, Leo Frank, who was hanged in Georgia 1915, after being accused of murdering a girl in a pencil factory he owned. He noted that other countries with catastrophic histories – Germany, Rwanda, Serbia, South Africa – have gone through some form of national reconciliation with their pasts. While the Cabinet itself does not take political positions, individual members get involved in justice reform, voter registration and perhaps more important, voter restoration. Vaughan is involved with the Voter Registration Coalition on a constitutional amendment in Kentucky to restore voting rights to convicted felons who have served their sentences.